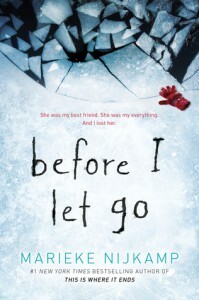 Corey has moved away from the small town of Lost Creek, Alaska, and her best friend, Kyra. It's been seven months and she's just days away from going back to visit. But Kyra has died. Corey is devasted and confused. How could this have happened? Kyra promised to wait for her. When Corey returns to Lost, it isn't the same small community who accepted her and talked about Kyra, saying she didn't belong because of her mental illness. It's the opposite - Corey is the outsider now and Kyra is praised for her talent. The people of Lost say her death was meant to be. But Corey knows it wasn't meant to be. She knows Lost is keeping secrets and she's going to find out what they are. When I started this book I thought it was so good! The writing was wonderful, the bond between the two girls was strong, the Alaskan setting was beautiful. I put this down just after the halfway point because I needed sleep. I couldn't understand how this book was getting such low ratings. When I picked it back up in the morning, I couldn't stand it anymore. It was SO repetitious. Corey is staying in Lost for just under a week and it's the same actions and conversations over and over and over. No characters had any real depth except for Corey and Kyra. And then when I found out what actually happened, ugh. It was absolutely absurd! Thank you to Netgalley and Sourcebooks Fire for a copy of this book.